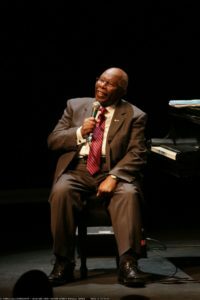 Over 300 people attended the sold-out concert on November 17th at L’Entrepôt in Lachine, where Oliver Jones performed one of his last shows before his retirement at the end of the year. Oliver Jones’ appreciation for his fans and his generosity were in full evidence on stage, but even more so after the show, as he signed autographs and had his photo taken with people for well over an hour. Funds raised from the event will go towards the purchase of new medical instruments in departments throughout the hospital.